PowerPoint eConvention – check out the winners! The PowerPoint eConvention hosted by PPT Heaven has closed and it is worth a visit to the site to see the winning entries. Check it out here. .Wav .MP3 .SWF What Can Be Embedded? This is a topic that comes up a lot, with my clients and on the PPT newsgroup. 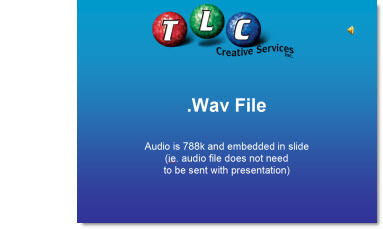 Basically, only the .wav audio format can be embedded into a PowerPoint presentation. This means the audio file goes with the presentation and nothing but the presentation needs to be distributed. All other audio formats need to be sent along with the presentation for them to work – they are linked. There is one exception, but it has a number of other issues, and this .swf files. A .swf is a legacy Flash file and it can be embedded into a presentation. As a side note, a .swf is really a .mp3 embedded in a .swf file format. To give a visual behind this I created a simple 3 slide presentation. So I was able to spend 2 days at this year’s PPTLive conference, which was really incredible! It is amazing to be in a room with almost 300 people that all use PowerPoint, but probably use it 300 different ways. I spent a lot of time the in Help Center and was able to share some of my projects from this year, answer questions and technical issues, and learn some new things myself. I am heading over to the PPTLive conference today and look forward to being with several of the PPT MVPs, hearing from the Microsoft PowerPoint Development team and seeing many people excited about what can be done with this great software. It’s too late for this year, but check out their website and consider putting this event on your calendar for next year. Click here. What is missing from the INSERT TAB in PowerPoint 2007? The User Interface team must have thought this was a common and valuable tool, so they placed it on the “Home”/Draw tab. Although this works, it really does not make sense, as the insert tab is, well, to insert things. Now the home/draw tab AND the insert tab have the insert slide button! You can read how to install and download the tiny add-in here. Hmmm, so as a Microsoft PowerPoint MVP you would think at least I would know of a Microsoft Feedback Page for Office 2007. But the truth is I just recently discovered this (along with other PPT MVPs). I can say that development and planning for the next version are underway at Microsoft, and that for previous versions the number of incidents reported or requests received did make a difference in the features updated, added, or removed. So if you encounter a bug or have a feature you would like to see in future versions I am guessing this is your best tool of getting that info to Microsoft! “Fonts that ship with different versions of Office” covers what fonts are installed with each version of Office (from 2000 and up). I have had a version of this information on my computer for years so I can design a presentation using fonts I know the recipient is certain to have on their computer. This is one of those – I hope you don’t need to do this – actions. But recently one of the computers here suddenly decided it did not want to have fonts work (line spacing was all messed up). So after troubleshooting everyway possible, verifying files opened fine on other computers, etc. I had the faint memory of being able to start any office application in Safe Mode. After a quick search on the PPTFAQ (thanks Steve!) I restarted PowerPoint in Safe Mode by holding down the CTRL key. Not sure what the solution was (not opening with AutoCorrect or Recent Documents…. ? ), but the file opened and displayed text as designed. Closed PowerPoint, launched again and all was fine from there. So when all else fails, starting PowerPoint with no extended features using Safe Mode can be your best friend. Just a quick post. Today, and only today, the website GiveAwayoftheDay.com has the PowerPoint optimizing application PPTMinimizer. You can download and install for FREE. Note: must be downloaded AND installed today to validate complimentary serial code. So what is an “eConvention”? Well, Shawn Toh of PowerPoint Heaven, also a PowerPoint MVP based in Singapore has created an online convention specifically for PowerPoint designers. September 1-26 (now) is open for anyone to review the entries and vote. Categories are Animation, Artwork, Game and Broadcast. Some are downloadable presentations, some are viewable on YouTube movies – all are very impressive! 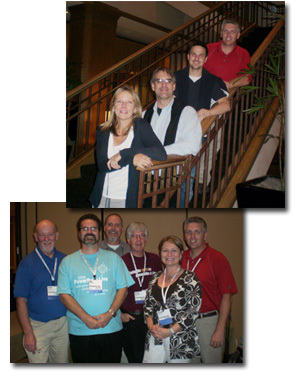 Then on Sept. 27 the eConvention comes to a close with all of the award winners posted. Check out the entries, and how to submit your own entry, here.